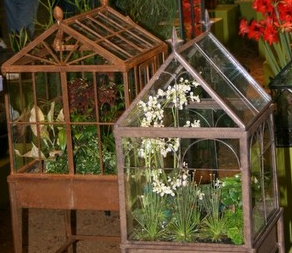 Sherri, at the Potomac Behnkes Nursery, muses on some fun terrarium ideas that made me chuckle. "Imagine a small footed-glass cupcake keeper with a beautiful African violet, a cake keeper with a delicate maidenhair fern, or a large glass cloche with a gorgeous orchid (“Beauty and the Beast” anyone?). Imagine a tabletop with three lovely cake keepers of different heights and different plants. Sorry, that is cheating…I saw it in Martha Stewart’s magazine."